This Policy of privacy and practices applies to The Lyric Theatre, and its web site(s). This policy does not apply to the practices of companies that The Lyric Theatre does not own or control, or to people that The Lyric Theatre does not employ or manage. With respect to our online information collection practices from children (persons under 13 years of age): We may collect the following types of personal information directly from children online: first and last name, e-mail address. However, we limit participation in our email communications to persons over 13 years of age. Please note that parents or guardians may consent to the above collection and use without necessarily consenting to the disclosure of personal information to third parties. 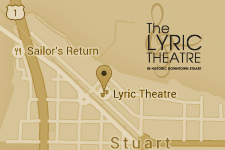 The Lyric Theatre may collect personal information when you register with us or our website or database services, or when you use our services. We ask you, as our client, to provide this information so that our database may have the most complete information concerning our patrons, and to facilitate certain services (such as: email list management). Once you register as a client with us and sign in to any of our services, you are not necessarily anonymous to us. The Lyric Theatre may collect information about any events, offerings, products or services you may register or publicize with us. Regarding email and internet Public Relations, our policy is to provide means for all recipients to "unsubscribe" or remove themselves from databased lists, and to update the databases within a reasonable time. All email addresses provided to us by our clients or any third parties for dissemination are presumed to have been vetted for permission and acceptance of email materials. The Lyric Theatre may set and access cookies for websites or online services on your computer. This is standard personalization practice in web services, and is a function that can easily be disabled by recipients or visitors by turning off their web browser’s cookies. Note that visitors with disabled cookies may not receive adequate or full functionality of database-driven or other online services or websites.